In a large pot, melt the butter over medium-high heat. Add the flour and cook, stirring, to make a light roux. Add the onions, celery, bell peppers, green onions, garlic, bay leaves, salt, and pepper and cook, stirring, until the vegetables are soft, about 5 minutes. Add the sherry and cook for 2 to 3 minutes. Add the stock and bring to a boil. Reduce the heat and simmer until thickened, about 5 minutes. Add the lemon juice and shrimp and cook until shrimp are no longer translucent (about 2 minutes depending on size). Adjust the seasoning, to taste. Serve over rice, garnished with additional parsley. Corn & sherry in etouffee?? 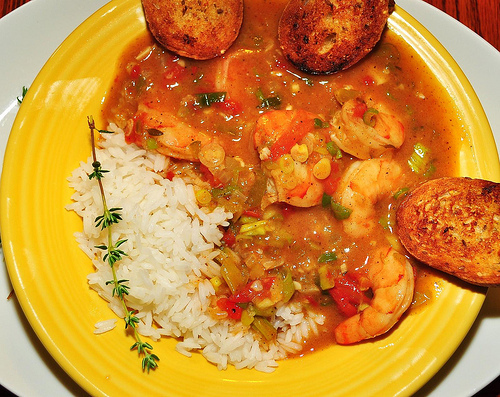 Methinks you are confusing etouffee with turtle soup or shrimp & corn soup. And if you buy head-on shrimp, you can make a stock from the shells & heads, avoiding the chicken stock (although it's an acceptable substitute.). Other than the sherry & corn, this recipe is accurate. I like to add hot sauce for piquancy rather than lemon juice and cayenne for a little heat. Also some thyme. Add the shrimp at the end and cook just until they're done. Five minutes at a simmer will probably give you rubbery, over-cooked shrimp. This recipe filled me & my family up without being too heavy. 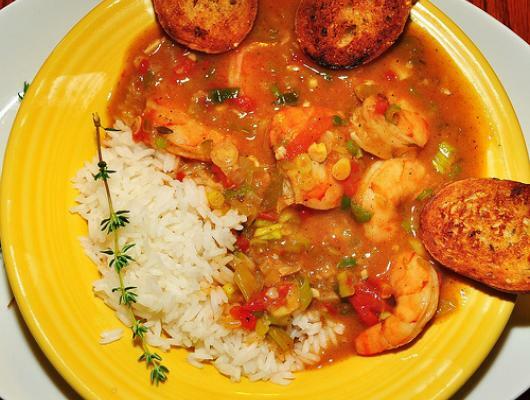 I don't care if this dish is considered true étouffée or not - I made it exactly to the recipe & it was AMAZING!